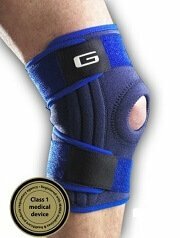 Neo G knee braces are rapidly growing in popularity and receive consistently good reviews from users. 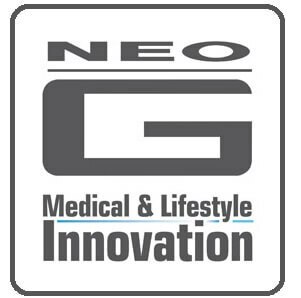 They were originally only available in the UK, but they've been so successful that a few years ago Neo G launched worldwide. All Neo G braces are Class 1 medical device registered with the Medicines and Healthcare products Regulatory Agency. I am really impressed with these braces and users frequently comment on how comfortable, supportive and great value for money they are. All Neo G knee braces are a wrap around style. This style often fits better than pull up sleeves as you can adjust them to your knee, and they are really easy to get on and off rather than having to pull them up your leg. They tend to stay in place better than pull up sleeves and can also be tightened as swelling reduces. All of these braces are made from heat therapeutic neoprene which helps improve local circulation, beneficial in the relief of arthritic pain or chronic aches and stiffness. 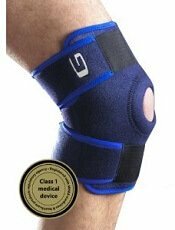 These Neo G knee braces are designed for use with mild knee pain including sprains and strains, general knee pain, bursitis, cartilage and ligament injuries, instability and arthritis. 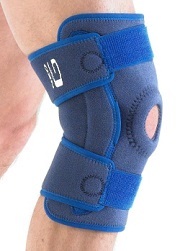 Open Sleeve Knee Support: This style has a hole and support buttress at the front. This reduces the pressure on the kneecap and surrounding bursa which can be helpful when there is pain at the front of the knee e.g. from chondromalacia patella or Runners Knee and helps with patellar tracking. Overview: This Neo G knee brace provides compression, support and warming relief to the entire knee complex without restricting movement. At only 2.5mm thick, it can easily be worn under your clothes, providing dynamic support whilst still allowing full, smooth range of motion in all directions. My verdict: The Neo G Closed Knee Support provides good basic level support and stays in place really well. Reviews are extremely positive however if you have problems with your kneecap, the open sleeve may suit you better. Average user rating 4.3/5. Overview: This Neo G knee brace improves stability by eliminating unwanted gliding and twisting at the knee. The brace ensures that weight bearing pressure during movement is more evenly distributed over the joint, which helps ease arthritic and meniscus pain. As the name suggests, the Neo G Open Patella Support has a hole at the front with a stitched buttress giving reinforced support to the patella and anterior knee. My verdict: A good, simple yet effective knee brace. I personally prefer open patella knee braces like this as they give better support to the kneecap without putting pressure through it. They also allow the knee to breathe better so get less sweaty. Average user review 4.4/5. These intermediate protection Neo G knee braces are suitable for mild to moderate ligament sprains and instabilities, meniscus injuries, arthritis, bursitis and general knee pain. 2) Have adjustable straps, providing improved support for the knee cap and are made of neoprene to retain heat for healing, just like the basic braces. The open patella area helps reduce pain associated with patella tracking problems, and offers relief from bursitis injuries and inflammation. The Neo G Stabilised Open Knee Support has three adjustable straps which allow variable compression and ensure a custom fit around the entire knee complex. My verdict: This is one of the best knee braces on the market offering intermediate support and protection and is my favourite Neo G knee brace. It is very reasonably priced and gives great support without being cumbersome. Average user rating 4.3/5. Advanced Neo G knee braces are designed to provide the maximum level of support for moderate to severe knee pain and instability. They are suitable for moderate to severe cruciate and collateral ligament sprains, instability, bursitis, meniscus injuries and arthritic pain. 2) As with basic braces, they also support soft tissue through compression and promote healing by retaining heat. Overview: This Neo G knee brace has an exclusive two point geared hinge system to control flexion and extension movements preventing hyperextension (knee bending too far back). It also reduces sideways instability. Featuring three adjustable straps, the Neo G Hinged Open Knee Brace provides maximum joint protection and stability. The open patellar area helps reduce patellar tracking problems and pain. My verdict: The hinge actually makes it easier to bend and straighten the knee whilst providing the necessary support. Simple to use and comfortable. Average user rating 4.3/5. Knee straps are designed to put pressure through the patella tendon and provide support underneath the kneecap, therefore improving patellar tracking. This helps reduce the forces going through the kneecap and patella tendon. They are simple but extremely effective, and people often can’t believe how such a small strap makes such a difference to their knee pain. 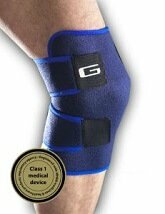 Perfect for use with Osgood Schlatters, Chondromalacia Patella, patellar tendonitis (jumpers knee) and Runners Knee. Also good for general anterior knee pain around the kneecap. Overview: The Neo G patella band features a silicon pad, designed to be worn directly below the kneecap, over the patellar tendon. This acts as a buffer and reduces the forces going through the kneecap and tendon. It also helps improve patellar tracking (how the kneecap moves). My verdict: Most patellar bands are just a strip of Velcro, but this has a plastic loops for tightening the band making it easier to apply than other straps, however it is a little pricey. 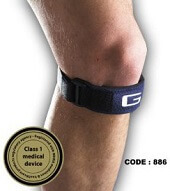 If you want a cheaper alternative, try the Mueller Knee Strap. Average user review 4.3/5. Choosing a knee brace can be difficult, especially as there are so many different braces on the market. Neo G knee braces are just one of the options out there. To find the best knee brace for you, visit the Knee Brace Overview section to find out about the different styles of brace available, what conditions they are suitable for, and which ones get the best reviews from users.